As the Orioles prepare to celebrate 20 years at Oriole Park at Camden Yards this season, the stadium is getting a bit of a makeover. It was announced back in December that renovations would start taking place this off season to make the stadium into more of a year-round facility. Subtle improvements to the stadium started prior to the 2011 season on the lower concourse. In 2011, the Orioles and their new food vendor, Delaware North, upgraded the concessions on the main concourse. 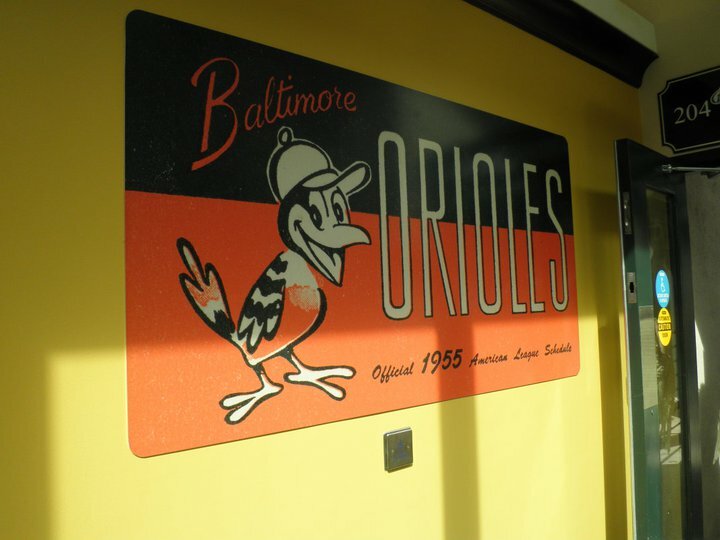 They also added Oriole-centric wall coverings and murals, and new flooring was installed in the area behind home plate. The improved wall coverings and flooring will now be installed throughout the stadium, making for a more polished look found in modern stadiums. The aesthetics aren’t the only changes taking place. 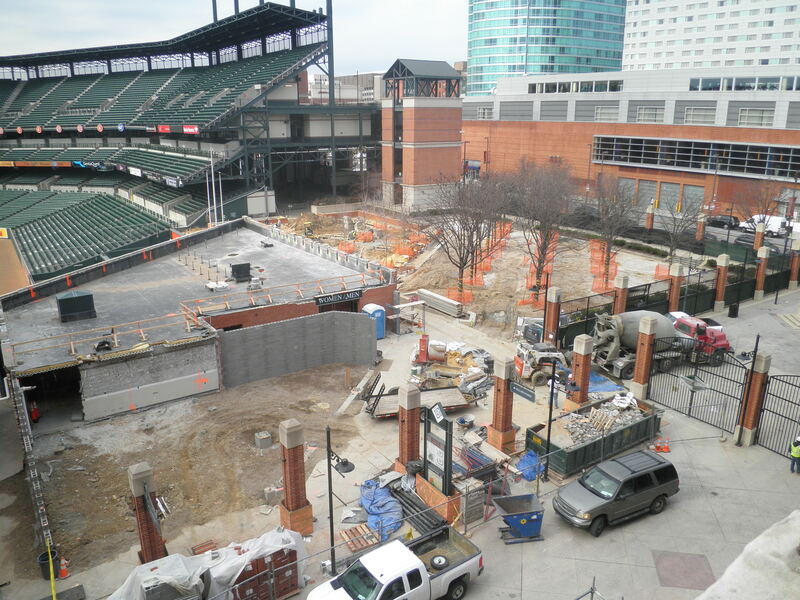 Eutaw Street is also getting a newer, yet older, look. 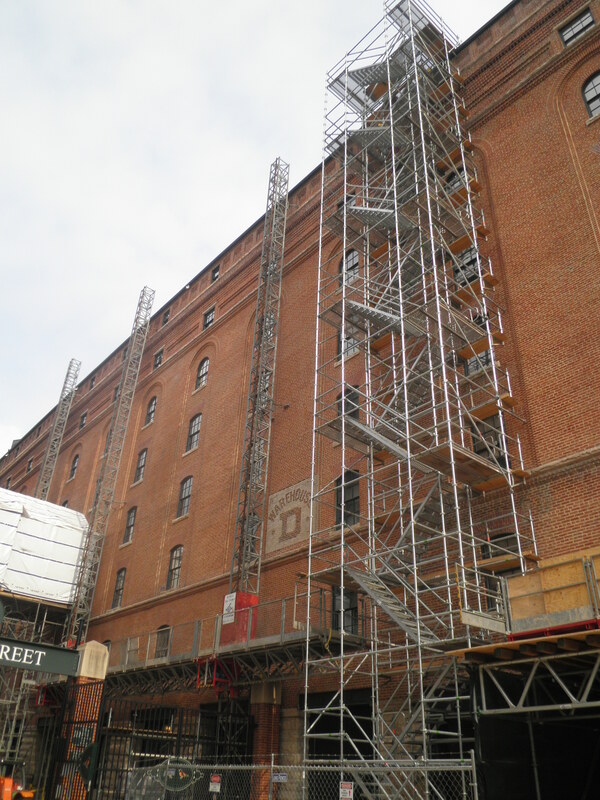 The Maryland Stadium Authority has already begun the restoration of the bricks in B&O Warehouse and is now adding a replica of the original canopy. The canopy will be used to cover the portable concession stands on Eutaw Street and provide shelter and/or shade for some additional seating and fans walking along the street. One of the coolest additions to the Eutaw Street experience will be the seating added to the top of the batter’s eye wall in center field. What used to be a perch for TV cameras will now be a casual seating deck with a bar. Any fan holding a game ticket can hang out on the deck. 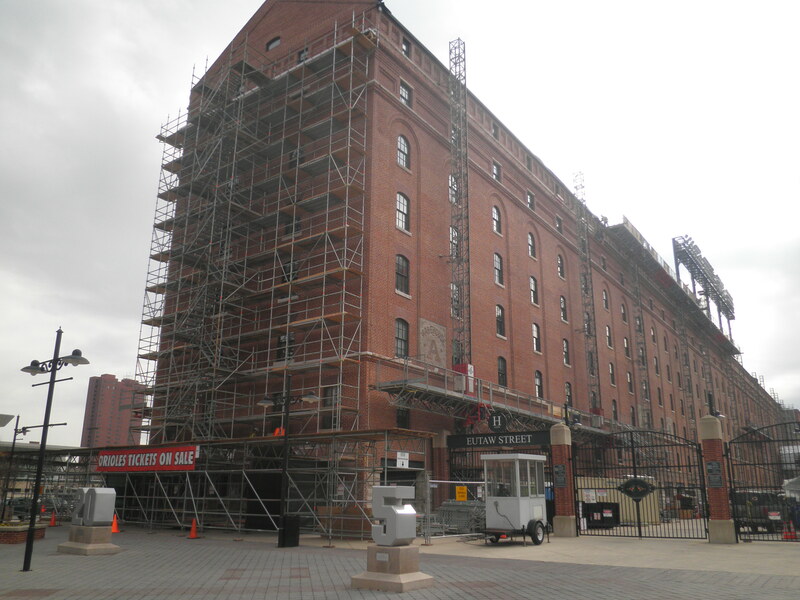 There will also be a new year-round restaurant added to Eutaw Street, replacing the Bud Light Warehouse Bar. The new restaurant will open in time for the 2012 season. The most striking change of all will be in the picnic area and flag court. The picnic area will not be for group outings any more. Instead six statues of Oriole greats will take the place of picnic tables. Larger than life statues of Cal Ripken, Eddie Murray, Brooks Robinson, Frank Robinson, Jim Palmer and Earl Weaver will be added to the bullpen picnic grove. Additional landscaping around the statues will also be created. The statues will be dedicated at separate games throughout the season, with each player in attendance for the unveiling of his statue. 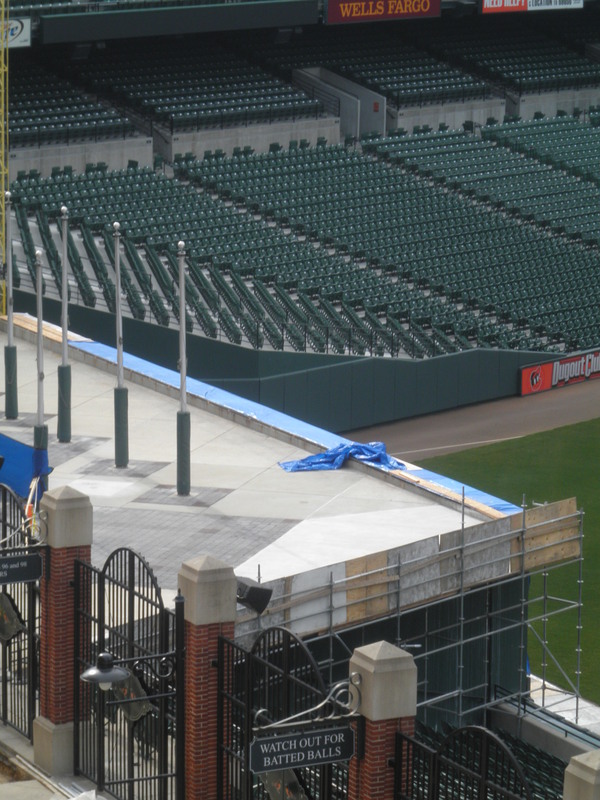 The flag court that is home to Oriole Park’s standing room only section will also be improved. The height of the out-of-town scoreboard in right field will be lowered by four feet to improve sight lines from Eutaw Street. MLB has already approved the modification of the right field wall. Concession and vendor stands in the warehouse will also be upgraded to take advantage of the improved view. So with all these new modifications, will the ballpark that started the “retro-classic” stadium trend lose its classic feel? The answer is a resounding “no”! The head of the project is Orioles VP Janet Marie Smith, who worked on the original design of Camden Yards. The team is taking every step to insure that Camden Yards doesn’t lose the look and feel that makes it stand-out from the rest of the league’s ballparks. Instead, the improvements will help the stadium keep up with the newer parks in terms of amenities, but maintain the charm that keeps baseball fans returning year after year.